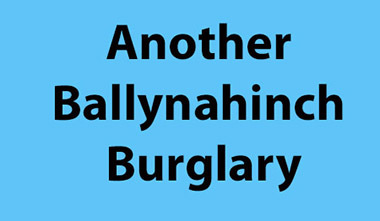 Detectives are appealing for information following the report of a burglary at a property in the Woodridge area of Ballynahinch yesterday, Saturday, 23 February. Sometime between 4.30pm and 9.00pm the premises were entered and a sum of money and jewellery stolen. Detective Sergeant Johnston would appeal to anyone who noticed any suspicious activity or vehicles in the area to contact detectives at Ardmore (Newry) on the non-emergency number 101, quoting reference 1343 23/02/19. Alternatively, information can also be provided to the independent charity Crimestoppers on 0800 555 111, which is 100% anonymous and gives people the power to speak up and stop crime.